For Pete and Joseph who had been involved in women's football for over two decades combined, a couple of tears were shed as almost half a country away in Moncton, Kyah Simon fired Australia into the quarter finals of the Women's World Cup - the first time an Australian team had won a knock out match at a FIFA tournament. 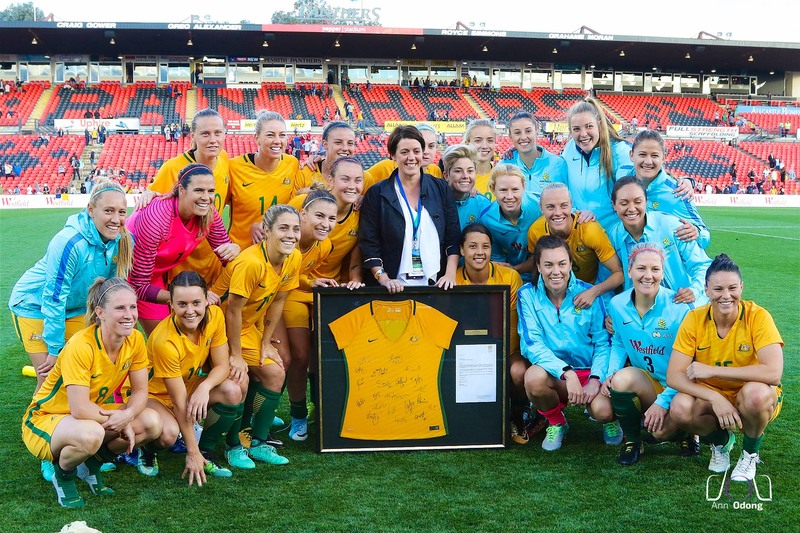 At that time it felt like a big moment for Australian women's football. A moment where it felt like the game may finally be moving well and truly in the right direction. On a Saturday afternoon in Penrith, listening to Advance Australia Fair ring out in front of 15,000 supporters, it felt like women's football in Australia had finally arrived. While for many it feels like women's football has arrived out of nowhere, it is really a three decade long odyssey that began with a team leaving Australian shores for the 1978 inaugural World Women's Invitational Tournament, in Taipei, Taiwan. That team had many great names - legendary names - like Sandra Brentnall, Sue Monteath, Cindy Heydon and of course Julie Dolan. At that time, the team didn't even have the moniker Matildas, they were just the Australian Women's National Team. Many paying to play and looking to represent their country. Pride in playing for Australia was what held those players together and would be the foundation of teams to come. Throughout the next 30 years over a hundred players would don the cap, with each generation of players making it that little less difficult for the next. Many of those players were present on the day including Dolan, Julie Murray, Moya Dodd, Renaye Iserif, Kate Gill and Dianne Alagich, while ahead of the Newcastle match, Cheryl Salisbury will be recognised with the PFA's Alex Tobin Medal. The fiercely fought battles on the pitch were equaled by the battle off the pitch for resources and recognition. There were strong advocates - like Elaine Watson and Heather Reid - for the game who fought for every cent, every jersey and gave hours and years of their lives to ensuring the national team would survive. "Women's football is now mainstream and it is an apt time to take a pause and thank those who advocated and battled, scraped and sacrificed to get it here. " There were also people who behind the scenes served the team faithfully like current Team Doctor James Ilic, long time team physio Kate Beersworth and long time team manager Jo Fernandes. As former Matildas attested to at the Football NSW Women's Football Forum, the support staff are integral to a team and people like Ilic, Beersworth and Fernandes perform multiple roles including stand in parent and confidante. That's why it was pleasing to see Beersworth recognised for her contribution on a momentous day. On Twitter and on Facebook, those involved in game over the past 30 years voiced their delight while in the stadium there were several tears shed. Speaking to several of those long standing contributors and looking around at the crowd, there was a palpable sense of shock as we remembered matches where there 200 - 300 supporters, travelling overseas where the only Matildas supporters were family and friends or having to explain who the Matildas were. Women's football is now mainstream and it is an apt time to take a pause and thank those who advocated and battled, scraped and sacrificed to get it here. They may not have been on the pitch, but Saturday was also a moment for them. For those of us enjoying in the women's game today, we truly do stand on the shoulders of giants.